Last week we said goodbye to Abby Meth Kanter, who retired after more than 20 years at the New Jersey Jewish News. 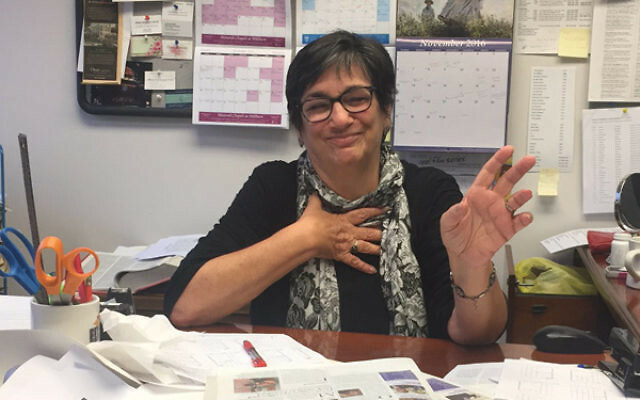 Her grandchildren, Maayan and Leo, will be lucky to have her full attention; her voice and vision will be missed by readers and staff alike at NJJN. Over the years, Abby has served as copywriter, associate editor, arts editor, managing editor, and finally executive editor. In addition to these official roles, she was always on hand as chief grammarian (both in English and Ivrit), linguistics expert, headline writer, spell checker, conflict resolver, and taker of calls from distressed readers. 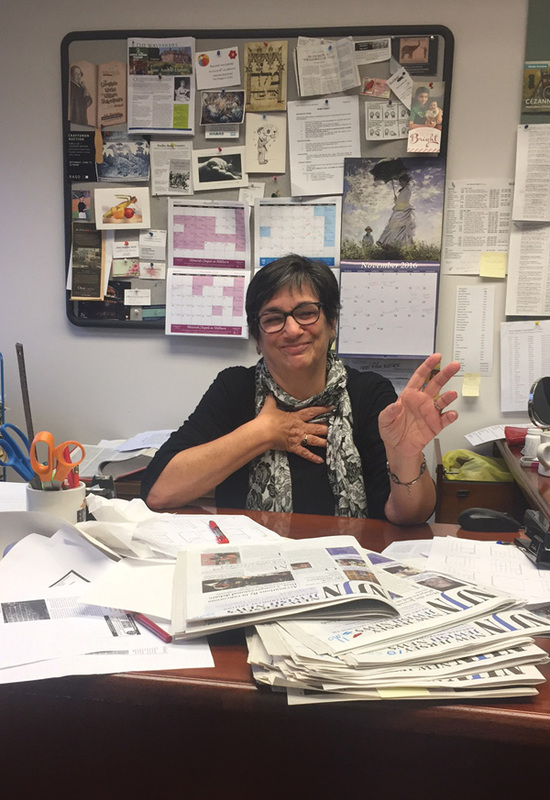 Over the years, she evolved into the staff matriarch, offering anyone who needed — even on deadline days — a shoulder to cry on, sage advice, and a welcome pep talk. She also ensured that, no matter the workload, the staff marked each Jewish holiday with rituals, explanations, and home-baked goods. Institutional history was also a specialty: which local agencies had internecine disputes that needed to be navigated with care in print; which local prominent figures needed hand-holding; and who must be reached for a quote on a late-breaking story. Although her constant pleas for the writers to submit their stories on time usually fell on deaf ears, she was committed to the success of the paper. But for Abby, the newspaper was an extension of her highest priority, the well-being of the Jewish community. She always had a pitch ready for a story on a member of the New Jersey community doing something good for Jews locally, nationally, or internationally (on occasion from her own beloved synagogue, Congregation Agudath Israel of West Essex in Caldwell). At the start of her tenure in 1995, Bill Clinton was president of the United States, Christine Todd Whitman was the governor of New Jersey, and Israeli Prime Minister Yitzhak Rabin was assassinated that year. The second Intifada was still five years away and Facebook would not be launched for another nine years. No one knew the name Golan Cipel (who would later go on to become Jim McGreevey’s lover), and Charlie Kushner was just a local real estate mogul, philanthropist, and macher. The world and the Greater MetroWest community is far different since Abby’s first day at the newspaper, and we’ll leave it to you to decide if the changes are for the better. As for us, we’re certain that NJJN won’t be the same without Abby.